Among his stops was a visit to Florence, where he dined with Grand Duke Francisco I de’ Medici and Bianca Cappello at the palace laboratory known as the Casino di San Marco. 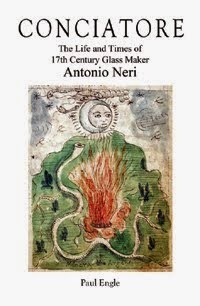 At the time, their son Don Antonio was a four year old toddler as was, in another quarter of the city, future glassmaker Antonio Neri. Within a few years both Francesco and Bianca would be dead, both stricken with pernicious malaria. Don Antonio would be sidelined as the future grand duke by his uncle, Cardinal Ferdinando de’ Medici. Don Antonio would inherit the laboratory complex and devote his time to the secrets of nature, where Antonio Neri would be employed as an alchemist and glassmaker. Montaigne 1842: Michel de Montaigne, The Complete Works of Michael de Montaigne: Comprising the Essays ... ed., William Hazlitt (London: Templeman, 1842). pp. 564-566.